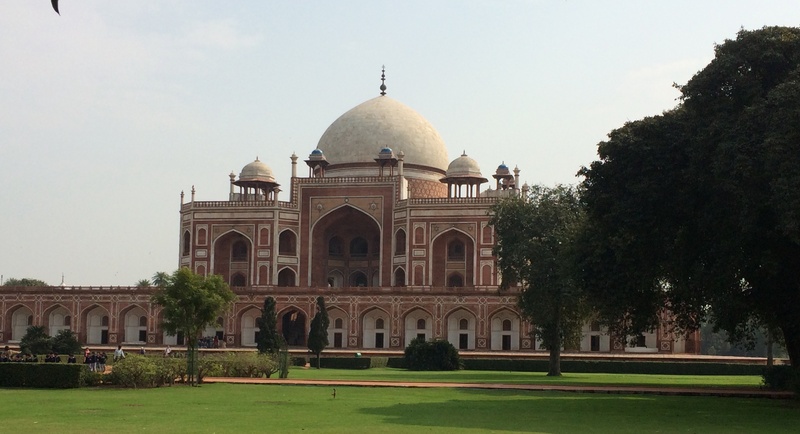 In Delhi we stopped at Mughal Emperor Humayan’s tomb, a precursor to the Taj Mahal. 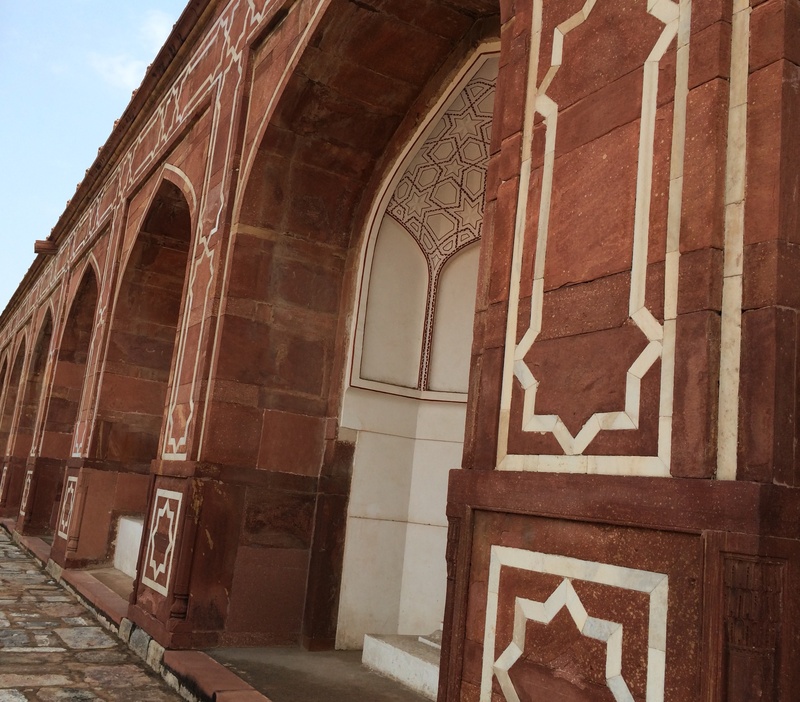 Emperor Humayan’s tomb of red sandstone and white marble. 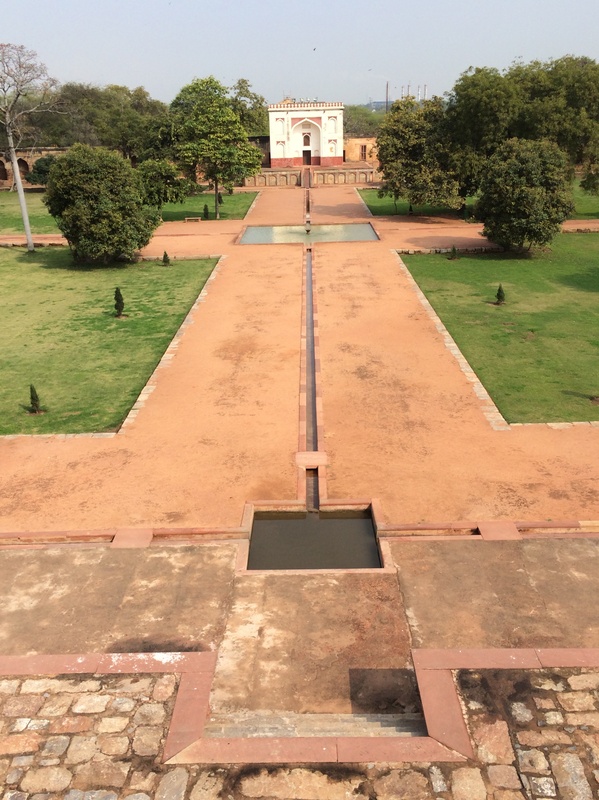 Built of red sandstone and white marble, it has lovely proportions, and symmetrical gardens surrounding it with water channels. Water channels connect the tomb and garden structures. It’s totally engrossing whizzing through India because there are so many colorful scenes that grab your attention and make you wonder what the story is behind it. 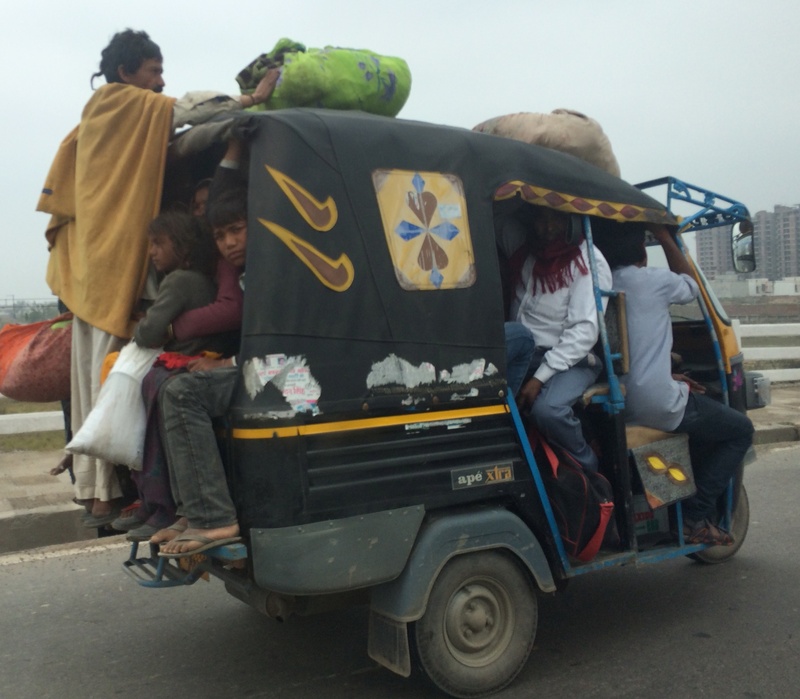 What’s the story behind the 3 wheeler with 12 people packed inside of it? 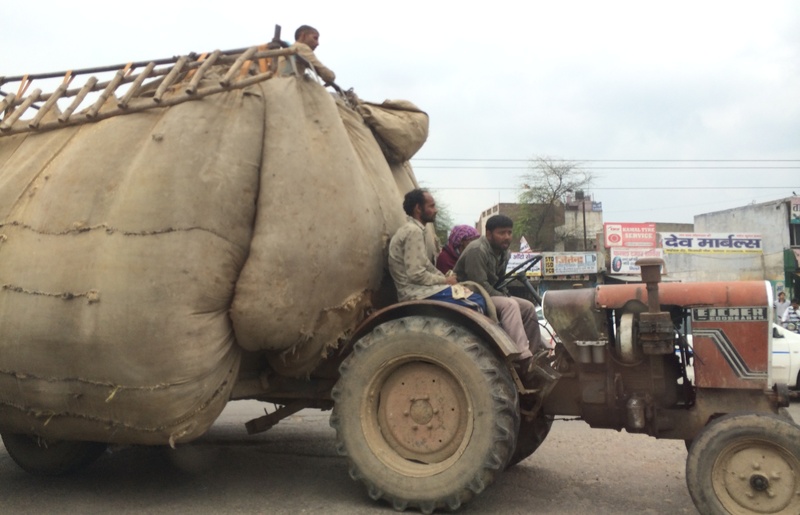 What’s the story behind these huge loads being carted by bikes? The sights and sounds are fascinating. Traffic is crazy where cars are trying to all go multiple directions at once (here are 4 vehicles converging including the one we’re in)! What is inside the monstrous bags? 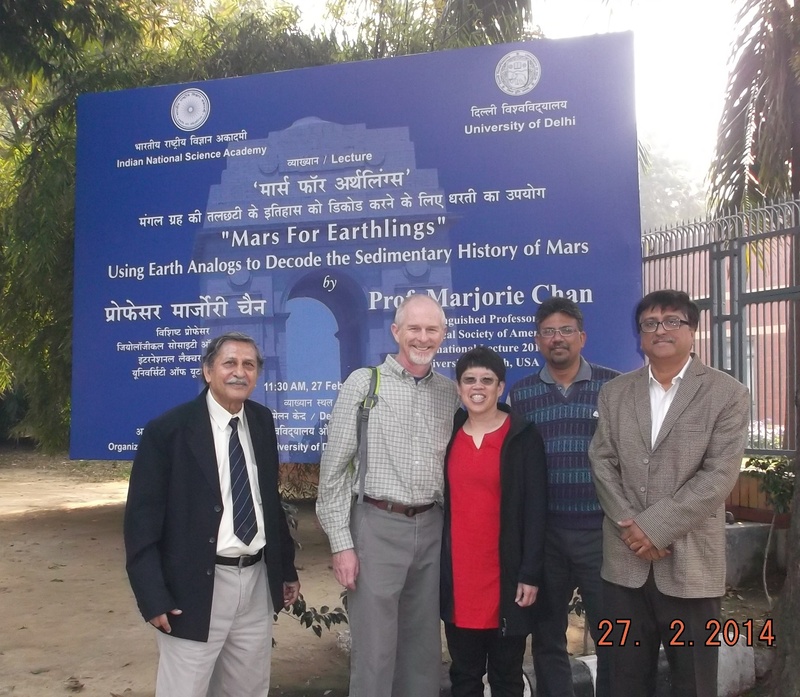 Prof. Dhiraj Banerjee (far left, retired professor and INSA honorary scientist) was my host in Delhi. 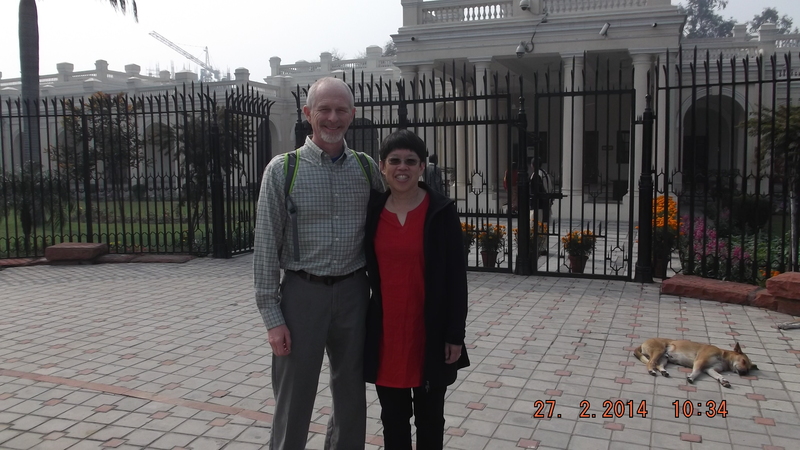 John and I stand in front of the former Viceroy’s residence at the University of Delhi (now an administrative building). In the right background, a common scene reminds one of the term “let sleeping dogs lie”. 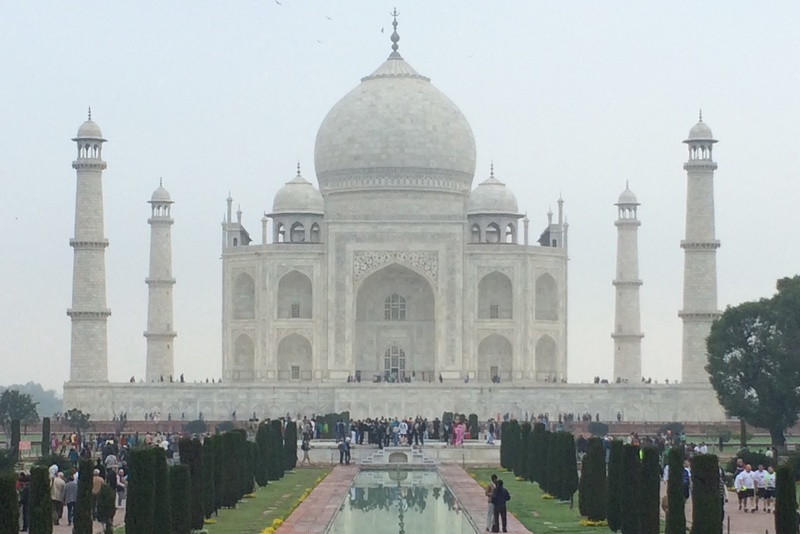 Our last look at India is the world’s most famous building- the Taj Mahal, built in the 1600s by Mughal Emperor Shah Jahan in memory of his wife Mumtaz Mahal. It is grand and beautiful. It took 22 years to build the Taj Mahal, with ~ 20,000 workers working 24/7. 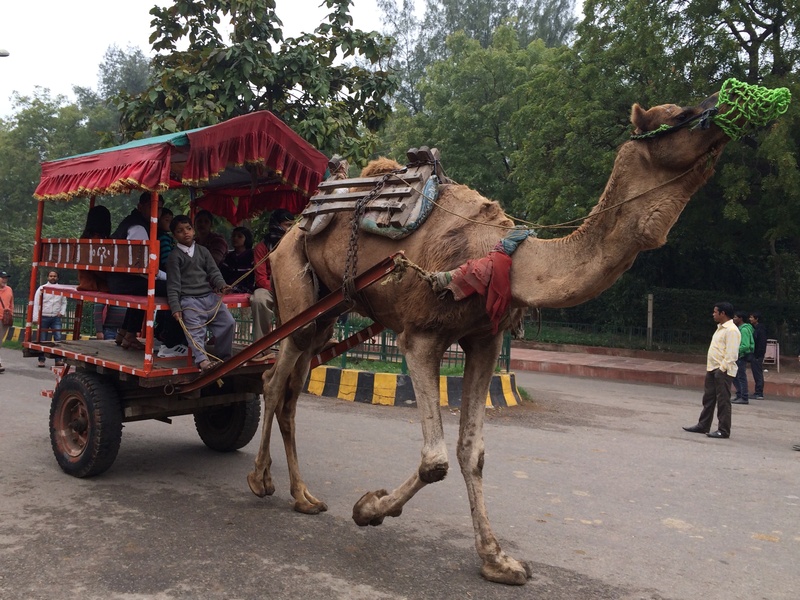 Camels transport visitors to the Taj Mahal. Akbar’s tomb nearby is also stunning. 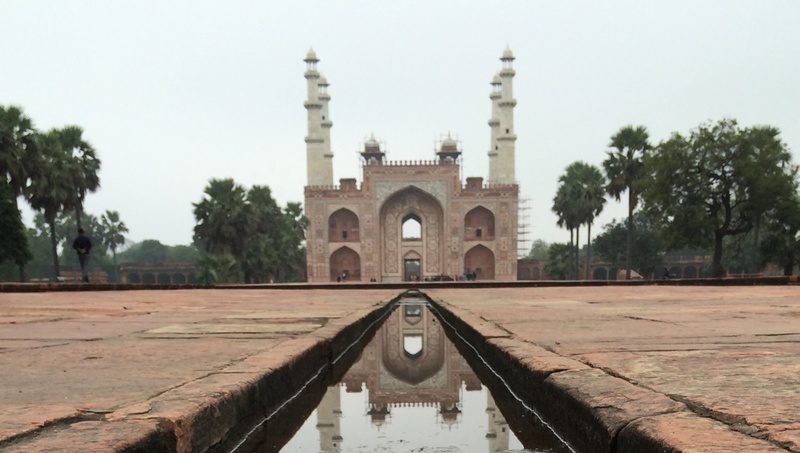 The gate at Emperor Akbar’s tomb is reflected in the channel pool of water. 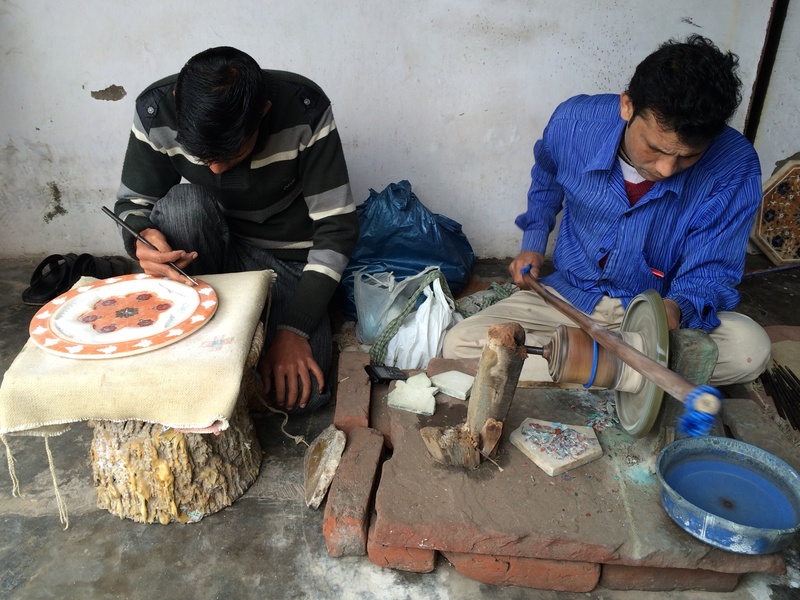 Skilled workers inlay semi-precious stones into marble, carrying on the art of petra dura that was incorporated into some walls of the Taj Mahal. 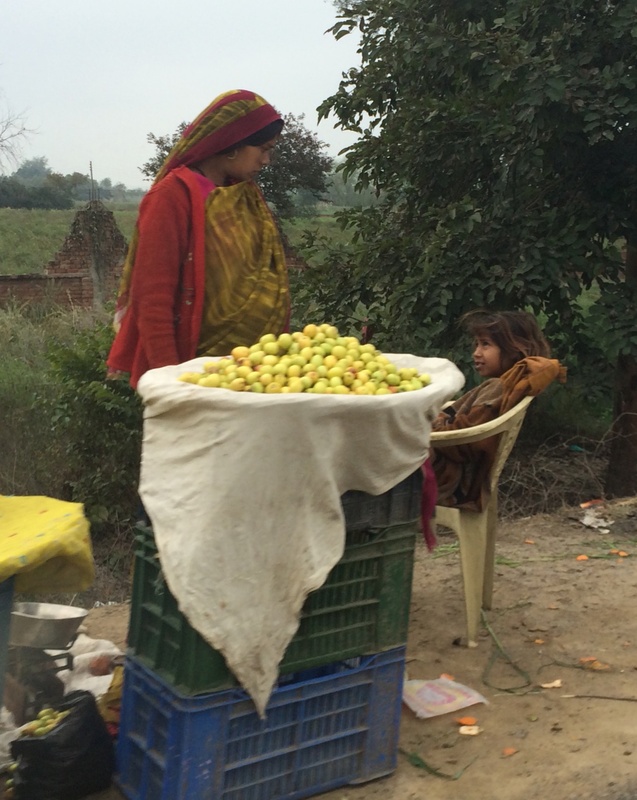 Sellers are by the roadsides everywhere- the fruits are especially colorful. 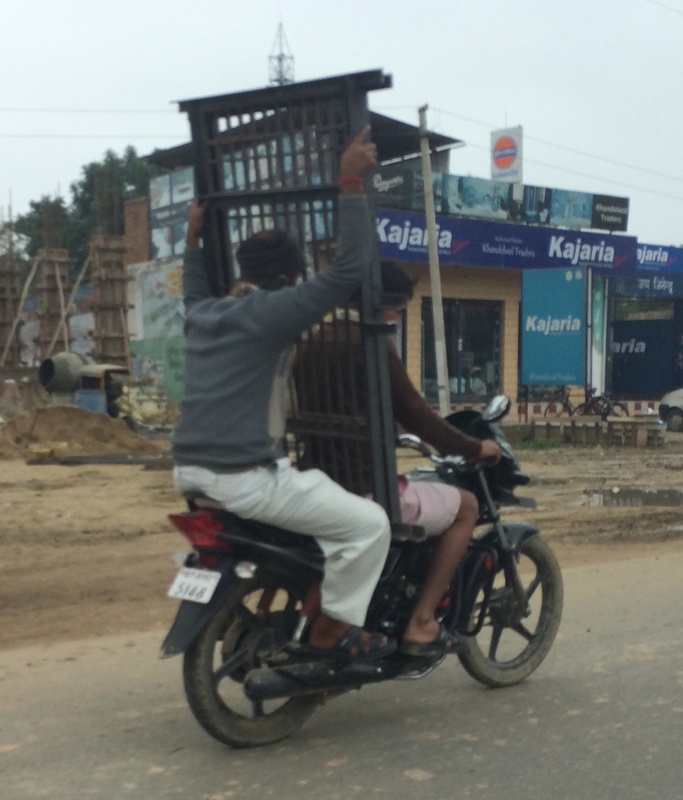 In the countryside, workers balance large loads on their heads. 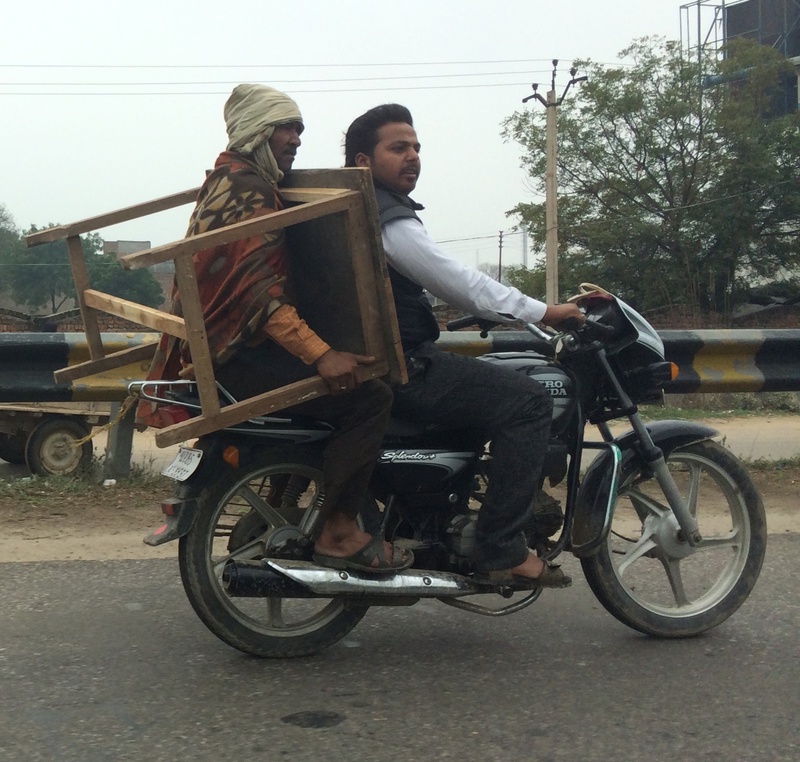 It’s amazing what you can carry on a motorbike……. 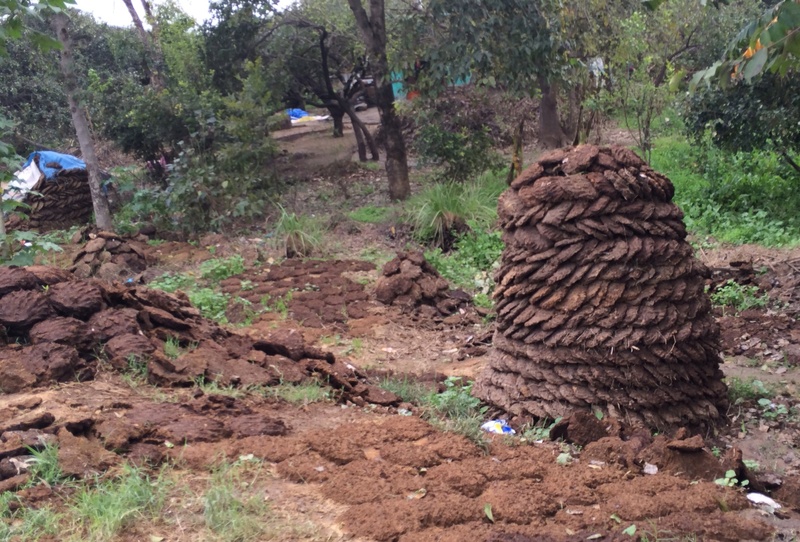 Hand shaped cow patties are an important source of fuel and are often stacked in interesting piles. Back in the big city, Delhi also has high tech skylines. 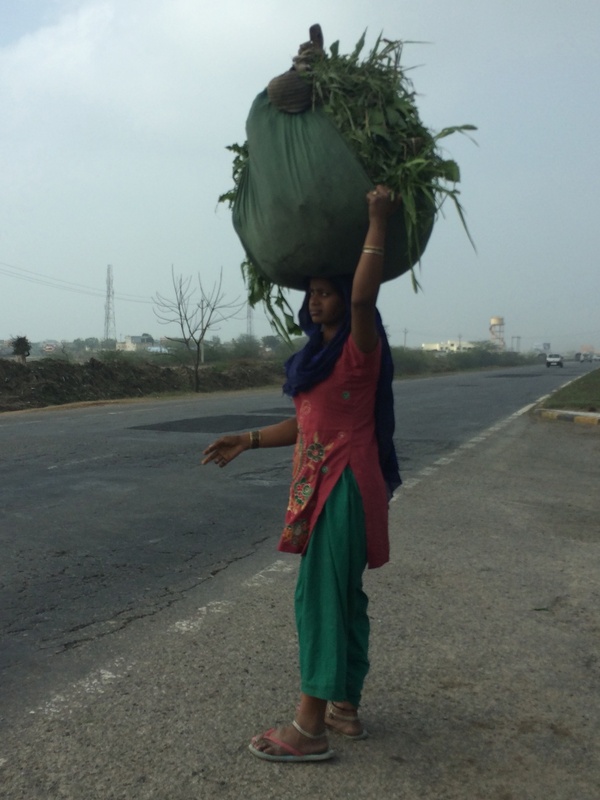 In all, India was a wonderful experience – our cup of tea. We bid a fond farewell to India- a land rich in heritage and culture. Thanks for following! 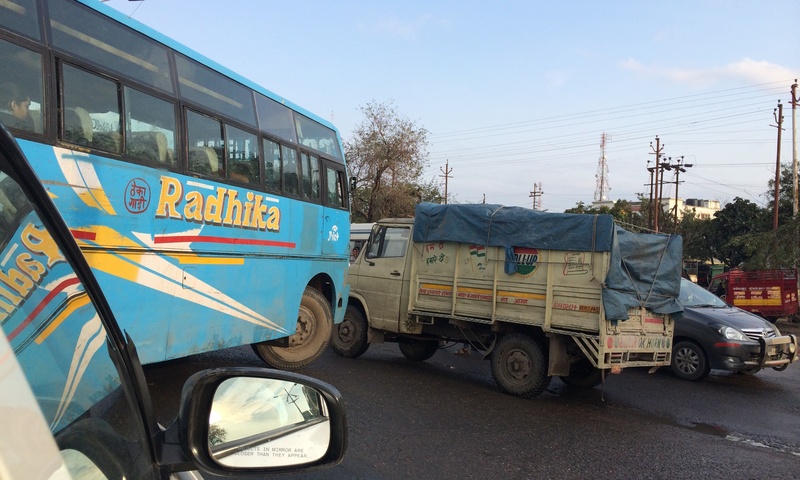 I think we saw some 3-wheelers with as 16 people counting kids! You have captured the country’s people beautifully. The transportation reminds me of my time in Haiti. How many people can fit in? One more!